While the U.S. version launched all the way back in July 08, it’s been a long wait for users across the pond. Along with announcing a new slimmer version of the PS3 and a bunch of other service enhancements, yesterday Sony revealed that the PlayStation video store will be opening its doors to parts of Europe from November this year. 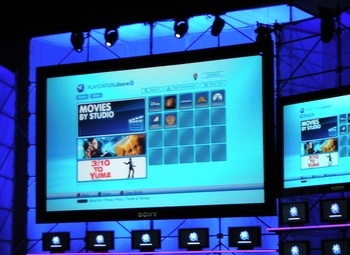 Film companies Lionsgate, Paramount, MGM, Walt Disney, Fox, Universal and Warner Bros have been signed up by Sony, which will result in the delivery of “hundreds of movies straight to your PS3 and PSP,” Sony’s Andrew House has confirmed at the Gamescom Sony press conference in Cologne. These films will be purchasable using the usual wallet system, and the store will be rolled out in other territories throughout 2010. While Sony will get there in the end — the company was already playing catchup in the games console delivered online video space even in the U.S. — the hold up is likely to be the usual issue of content licensing. Striking deals in one territory doesn’t guarantee speedy success in another. In related news, Sony also announced that in the UK, the version of the BBC’s iPlayer TV catchup service for the PlayStation 3 will be promoted through the console’s ‘What’s new’ section being introduced as part of a new firmware update. BBC iPlayer lands on PlayStation 3 – could Hulu be next?